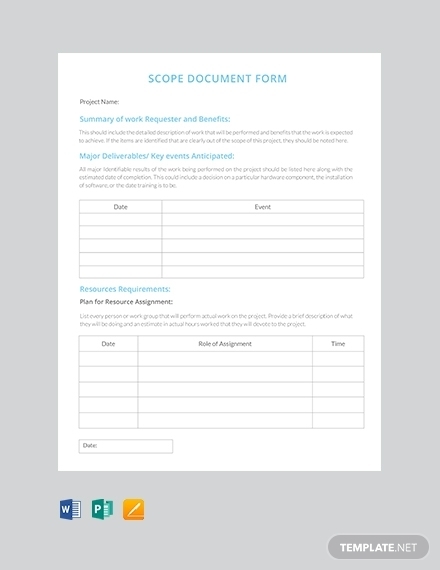 A scope of work template is one of the most important documents in a real estate business. The primary goal of the file is to help you describe work details and the expected output. It also includes specific schedules as well as terms and conditions of the work. A scope of work doesn’t have to be so many pages. More often than not, a one-page document is enough. You just need to make sure that the description of the real estate project is clear and the terms are easy to understand. 1. What work do you want to get done? Provide a clear description of the work you want to get done. Keep it short and comprehensive. State the type of service or labour that you would like to hire and make sure you name the parties involved. Write down the terms of the agreement, the timeline of the work, as well as the start and the end date. Once you get to know “What has to be done”, then it’s time to define “What could be the Scope to materialise the plan and get the work done efficiently”. That involves a few details about technical info and the budget allotted. Brief about them to create a basic awareness about how much is the budget & how well it can accommodate the project plan to get materialised. Also, state the deliverable to be produced in accordance with the timeline. This will help you define a path to create a step-by-step process without overlaps. Now that you know the magnitude of the work you need to be done, it is time to break down the task involved into small manageable sections to make work easier for the parties involved. A task list is not a deliverable. It is what a worker should do to meet a certain objective. Your task list needs to be clear so that the parties involved, understand what it is you really want. Be clear about administrative work timeline as well, to avoid certain confusion which leads to delay of deadlines or unnecessary repetition of work. A scope of work must have a start date and end date. This is something you need to figure out before the work starts. Also, think about the resources required to start and complete the work in question. This will help you to plan your work in the very best way possible. Below is a list of the top 10+ best scope of work samples that you can use to manage different tasks in your real estate business. Here is a sample action plan that you can use to plan and allocate work in a real estate environment. This template features the duration for the engagement. It also lets you specify the start and end date of the scope of work. Moreover, you can divide the tasks into phases. Then, schedule time and budget for each phase. 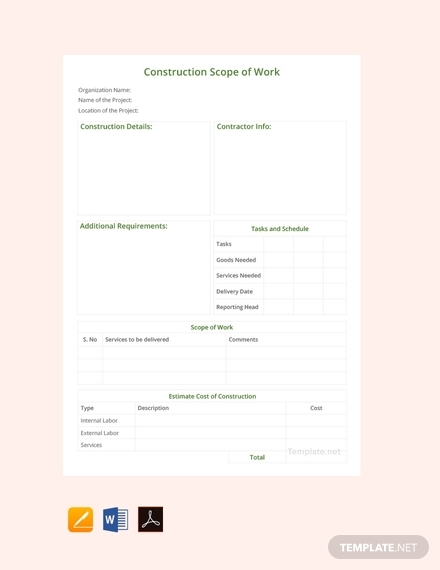 This construction scope of work template is a useful document for new as well as existing real estate business. Use it to outline contactor details and the work you expected them to do. Indicate the delivery date in the task schedule section. Then use the same file to estimate the cost of the project. One of the key responsibilities of a real estate agent is to make sure clients’ properties are in order. Sometimes, the need for property repairs is likely to arise. So, it is upon you to make sure that you create a scope of work for repairs. You can do that using the following template. If you are a real estate broker hired by a client to supervise a construction project, this template is for you. 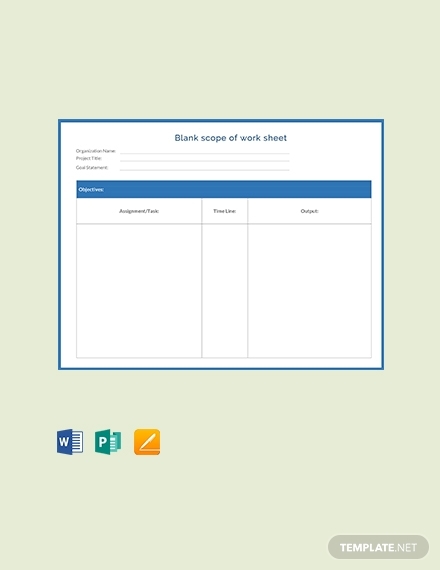 You can use it as a project management template for scheduling tasks accordingly. Simply assign a date to an assignment, allocate time, and then request the relevant labourer to get down to work. This template is for real estate investors who want to allocate work to real estate brokers. The 3-colum, one-page document is available in Word, Publisher, and Pages. Write down the assignment you would like an agent to complete, give the task a timeline, and list down your expected output in the third column. 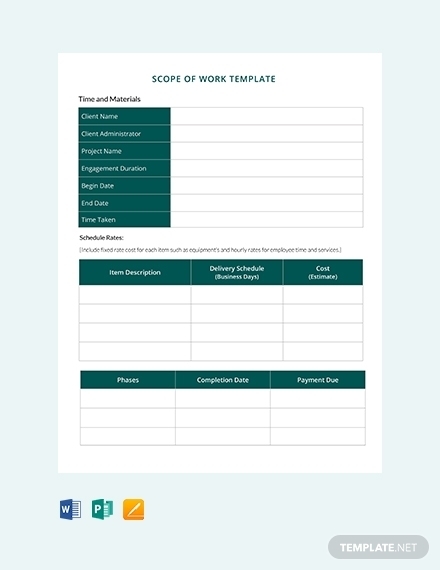 This work schedule template is available in Pages, Editable PDF, and Word format. You can schedule your work according to objectives, set a reasonable time for the job, and highlight the expected output. This template also lets you track the status of your real estate work on the go. Changes are inevitable, even in a real estate environment. When the need to adjust the budget of a project arises, the scope of work is also likely to change. 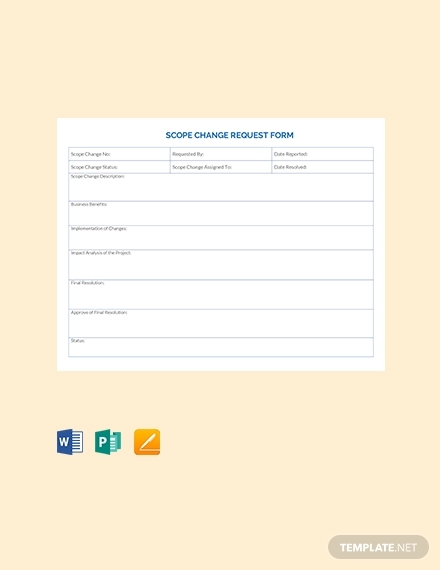 Using the scope of work change request can help you make the necessary changes in the work process with ease. This free template is editable and easy to customize. Employees of a real estate company need to know what to do and when to do certain tasks. It is your responsibility as a business development manager to make sure their scope of work is detailed and precise. 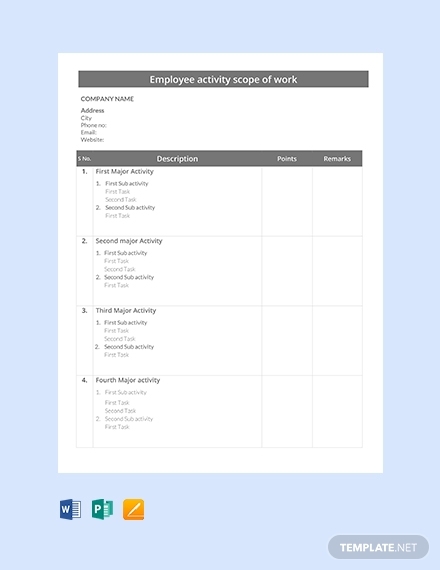 You can use this sample template to organise a professional work schedule for every employee in the company. Use this template if you are a real estate owner who would like to consult real estate developers about construction work. 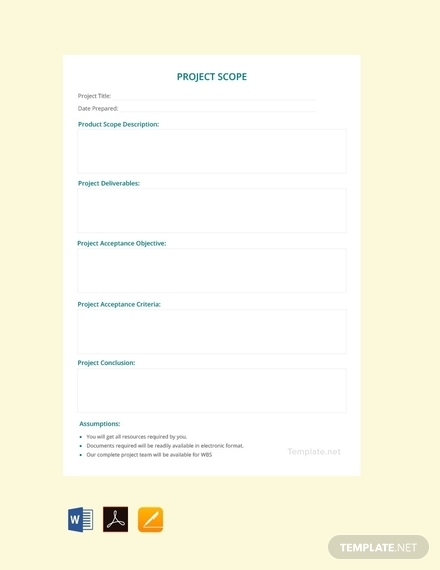 The template is a good option because it lets you describe your project. It also lets you to create an investment plan to help you determine how much the work in question is likely to cost. 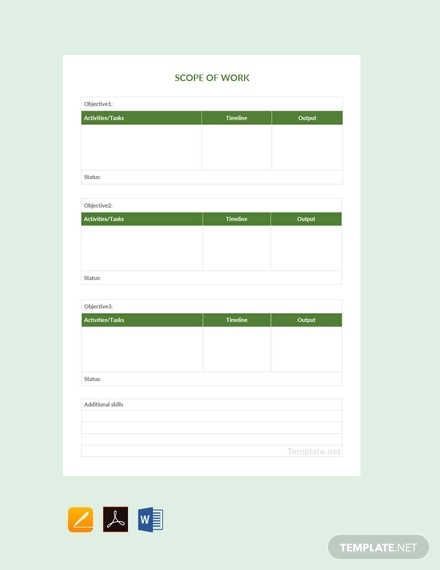 If you are looking for a free, easy to use scope of work template, this template is for you. 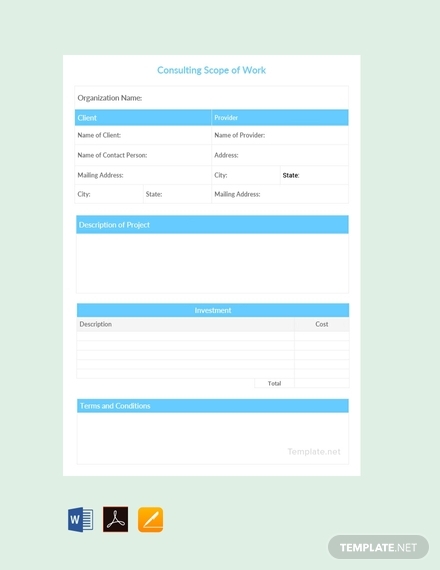 The template, which is available in Word, Pages, and Editable PDF, lets you provide as much details of the project as possible. The result is a very clear description of the scope of work. 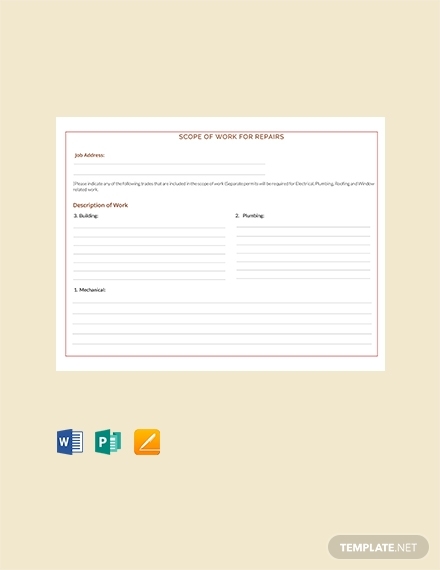 The document is available for instant download and it is very easy to edit. 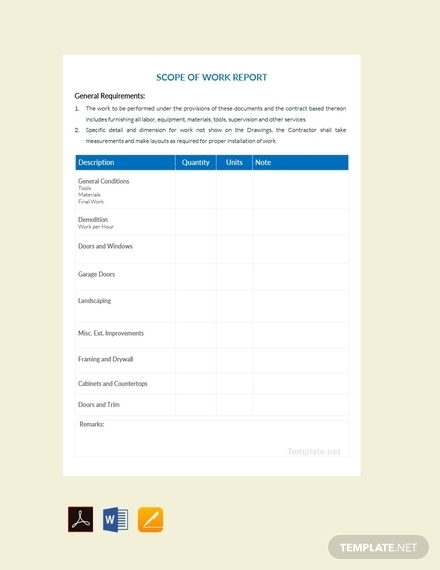 The scope of work report template is a good option for real estate employees. It’s useful for providing a summary of the work completed within a given time. The file is available in Google Docs, Editable PDF, Pages, and Word Format. The file is fully editable. It is also easy to customize.